This post contains major spoilers for this year’s Doctor Who Christmas special, which has not yet aired in the United States. Those who have not downloaded it and are planning to watch it when it airs are advised not to read this review until after viewing the episode. The Next Doctor began with The Doctor arriving in London on Christmas Eve in 1851. He heard a woman calling for The Doctor and found the call for help answered by someone else who identified himself as The Doctor. Both aimed their versions of a sonic screwdriver at a creature which appeared to be part animal with the face of a Cyberman. The relationship with his companions has often been what has made an episode of Doctor Who, even when faced with an otherwise weak story. The Doctor is currently without companions, and this other Doctor served the purpose of a companion, as well as the purpose of adding interest to what otherwise would have been a weak episode. 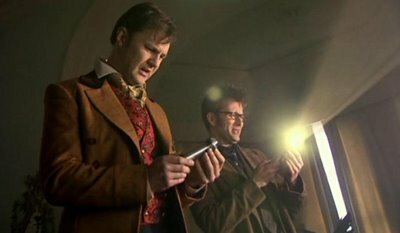 Initially The Doctor almost played second fiddle to David Morrissey’s version of The Doctor with the suggestion that he is a future version of himself. If this was true, the second Doctor should have memories of this event from the first time around from his perspective. Initially they appeared to get around this by revealing that the other Doctor has lost many memories. This could have been a consequence of his battle with the Cyberman, which forced a regeneration (which doesn’t always leave The Doctor in the best shape). While a future incarnation with lost memories initially appeared to be a satisfactory explanation, holes soon developed in this theory. The other Doctor’s sonic screwdriver turned out to be a regular screw driver which, in order to make noise, was banged against the wall. The Doctor tried to use a fob watch worn by the second Doctor to restore his memories as seen in Human Nature, but it turned out to be just a regular watch. When the other Doctor mentioned blinking, The Doctor tried to jog his memory with the events in Blink. The Doctor asked to see the other Doctor’s Tardis, and found that it was a hot air balloon:Tethered Aerial Release Developed in Style. The Doctor figured out that the other person was not really a Timelord without even bothering to check out how many heart beats he has. He was actually Jackson Lake, the first person who disappeared when the Cyberman attacked London. Lake used an infostamp, which contains vast amounts of information including data on The Doctor, as a weapon, finding it could destroy the Cybermen. In the process of using the weapon Lake’s mind was overwhelmed by the infostamp, as well as the shock of seeing his wife killed, and Lake believed he was The Doctor. Less clear is why The Cybermen also believed Lake was The Doctor and ignored the actual Doctor. The Cybermen aspects of the story were far less interesting than the Jackson Lake storyline. The infostamps made it too easy to destroy the Cybermen. There was the usual human who helped the alien enemy, and then was shocked to find the aliens inevitably turn on her. Miss Hartigan was converted to the CyberKing against her will. While it was a different twist from a frequently used storyline, I found it unrealistic that Hartigan’s mind would turn out to be too powerful and that she would wind up in control. 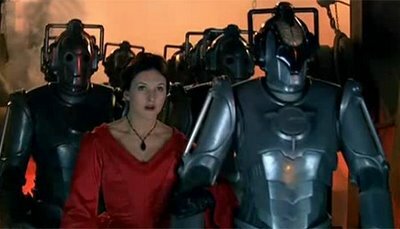 The episode tried to make up for a weak plot by resorting a conclusion which literally features a giant Cyberman threatening London. 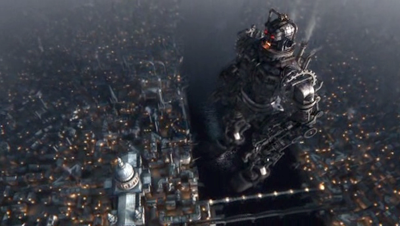 The Doctor used the hot air balloon version of the Tardis to get to the level where the CyberKing was located. Just as it was too easy to destroy Cybermen earlier in the episode, The Doctor had little difficulty, using a combination of infostamps and another gadget he happened to pick up along the way, to sever Miss Hartman’s connection to the Cyberman after she refused an offer to be transported elsewhere to live in peace. Supposedly Miss Hartman’s mind was in control, which seemed to contradict what happened next. After the link was severed, Miss Hartman was appalled by what she had become. She then self-destructed, also destroying the Cybermen. After easily saving London from harm, The Doctor discussed his relationship with his companions with Jackson Lake. The Doctor explained that he had no companion at present as they break his heart. The Doctor told Lake that the other companions either leave him, meet someone else or forget about him. The last refers to Donna, who lost all memory of her time with The Doctor at the conclusion of Journey’s End. There has been speculation that one of the specials airing over the next year will deal with a resolution to Donna’s problem and this might be foreshadowing such a development. The show was a fair but not great episode. Perhaps the most disappointing part was the knowledge that we will see so little of Doctor Who over the next year, and will not be seeing David Tennant for much longer. This episode seemed to be a waste of so little time remaining. Q: You admitted recently that Battlestar‘s themes of faith and religion were something the network requested after reading a line in the miniseries. How did it evolve? A: It was very natural. At Trek I was always trying to work in those angles and blur peoples’ religions, but it was very much not a part of what Trek was about — it just wasn’t part of Gene’s vision. It appealed to me because science fiction shows just didn’t go there. I thought the idea of robots who believe in God was just a fascinating concept. And then I really liked the idea of the polytheists versus the monotheists, and that the monotheists were actually the “bad guys” because there’s certain repetition in Western society of the one God driving out the many. There were just layers and layers to play with. Q: Fast-forward to the Season 4 mid-season finale, when they find their faith has driven them to hell. Was that faith for naught? A: There’s a lot of that going on. The journey is not over, but certainly both sides are suddenly faced with the prospect, “Maybe it’s all been for nothing. Maybe there is no God, and if that’s the case where do we go from here? What does it all mean and what are we going to do with ourselves?” which I think is a great place to take the characters. Q: And then you have Baltar, who goes from a man of science to a man of faith. A: Since the beginning, Baltar has been challenged on that very issue. He begins with a profound, shocking realization that he is personally responsible for the destruction of billions of people, and that there seems to be a God who wants him to do that. He’s gone through so much, and had so many failings — been so vilified– that there’s a part of him that wants somebody to take the responsibility off his shoulders, and is hoping against hope that as a scientist and atheist he’s wrong. Q: The build-up to the final Cylon has been unprecedented. How is the revelation not going to be a letdown? I felt like the series I was telling, unlike The Sopranos, had a beginning, middle and end. So as much as I love The Sopranos, I never seriously thought that was an option for us because it’s just not part of our narrative. Theirs was about these characters’ lives that presumably were going to continue beyond the final fadeout. Our finale will be the end of our narrative, the period at the end of the sentence. No, it would not be satisfying if the series ended with the fleet on the run, the Cylons attacking, and the screen going to black. “That’ll be everyone’s question,” says Moore. “I don’t think there’s an easy answer. That’s a very individual choice. I don’t think there’s a definitive list of what makes it ‘Star Trek’ or not. Interestingly there’s one thing that “Khan” and two other installments in the movie franchise featuring the original cast — “Star Trek IV: The Voyage Home” and “Star Trek VI: The Undiscovered Country” — have in common, besides being, IMHO, the best of the lot … writer/director Nicholas Meyer. “He was a man who had no prior relationship to the franchise whatsoever,” Moore says, “never even saw it. And he was not afraid to not worry about the continuity of it all. While they were not hung up on every continuity point (and there were some errors for purists), it is also notable that the movies did take place in the same Star Trek universe as the television series. The characters were at a different point in their lives but they did not throw out the previous history with a total reboot as some now advocate for Star Trek. Despite several series, The Star Trek universe is flexible enough to allow for such updating and new stories without needing to ignore the past. There is a tremendous difference between trying to reboot a series with a strong history such as Star Trek and totally redoing a weak show such as Battlestar Galactica. In the case of Battlestar Galactica, I agree Moore was best off restarting from scratch rather than being tied down by anything from the original series. “It taught me that you really can stick to your guns and do a good show. You can do a smart show and really ask a lot of the audience. You can challenge them. You can not deliver Pablum, and they will go with you. “You don’t have to give the easy answers week to week. You don’t have to have uncomplicated heroes who always do the right thing and always save the day, that you can really challenge the audience. Information has been released on the memorial service for Majel Barrett Roddenberry, which is to be held on Sunday, January 4, 2009 at 10:00 a.m. in Los Angeles. Additional details are available here. The other big news of the week was the airing of the Doctor Who Christmas special, The Next Doctor. I was originally going to review this in SciFi Weekend, but as any discussion would include major spoilers for US viewers who have not downloaded the show, I’ll place it in a separate post. I would advise those who plan to watch the show in the future to not read my post, or any other discussion of the show, until after it is viewed. The automotive companies aren’t the only ones to suffer from bad management decisions in Detroit. Time questions how the Detroit Lions can manage to become the first team to likely go 0-16 since the season was extended to sixteen games. Before the Lions, only the 1976 Tampa Bay Buccaneers managed to go winless for a season, but that was in a fourteen game season, and the Bucs were an expansion team in their first year. 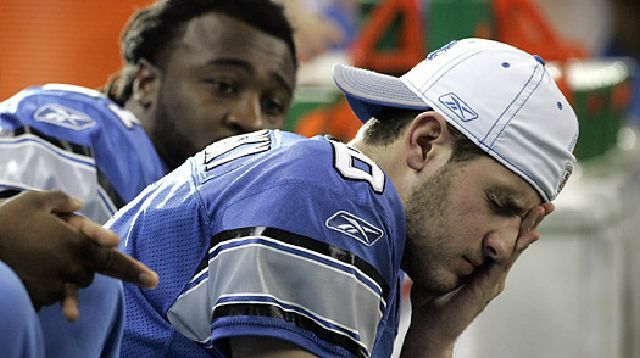 Detroit hasn’t had a winning season since 2000. Football experts all agree that in today’s “any given Sunday” NFL — where every team seems to have a decent shot to win, where a salary cap structure, and a draft that gives the worst teams access to the best young talent in a young man’s game, creates league-wide parity — going winless is awfully hard to do. “It’s mind boggling to me,” says Troy Aikman, the Hall of Fame ex-quarterback for the Dallas Cowboys and Fox Sports analyst, who lived through a nightmarish 1-15 season himself as a rookie back in 1989. Several teams, in fact, have only managed to put together one victory in a season, including the 2007 Miami Dolphins and the 2000 San Diego Chargers . But failing to eke out one win in a league built on mediocrity takes a certain stunning level of ineptitude. Lions owner William Clay Ford Sr., 83, the grandson of Henry Ford, has only added to the hopelessness. Since Ford acquired the Lions in 1964, the team has won just a single playoff game. Millen, for example, was given an inexplicable five-year contract extension before the 2005 season, so he’s still being paid for destroying the team. Ford has promised to bring Martin Mayhew and Tom Lewland, two Millen-era execs who helped assemble the ’08 disaster, back for another year. Their coach, Rod Marinelli, hired his son-in-law Joe Barry to be his defensive coordinator. How has that worked out? The Lions have been the NFL’s worst defense since Barry took over two years ago. Three out of four Americans are happy George Bush is leaving office according to a CNN Poll. Considering how much harm George Bush has done to the country in the last eight years this is hardly a surprise. There is a dissenting twenty-three percent who are sad to see him go. Are these people who are totally oblivious to what has happened the last eight years, people with no sense of morality, or masochists who would also love to spend eternity being kicked in the head? For comparison’s sake, forty-five percent were sad to see Bill Clinton go at the end of his term. Presumably the number who wished he would go away was much higher by last spring. One third who were polled hope that George Bush remains active in public life after leaving office, compared to fifty-five percent who (at least back then) wanted Bill Clinton to maintain a public role. I wonder what kind of public life they desire. George Bush has showed during the last eight years that he is totally incompetent and has little understanding of (or real interest in) public policy. At least having Bush involved in public life after out of office, and when he no longer has any power, is far safer than having him involved while having the power of the presidency. The Obama team is determined to avoid the mistakes of the early 1990s, when the Clinton White House created a healthcare policy team that had more than 500 members and spent months secretly developing a 1,342-page proposal with minimal input from Congress. A lack of investment among congressional leaders helped doom the bill, which never even went to a vote. Obama and his team – headed by former Senate majority leader Tom Daschle, who will serve as a bridge to Congress – have already begun privately engaging with congressional leaders and have emphasized that they intend to work more collaboratively on healthcare than the Clintons did, said the two leading Democratic senators on healthcare reform. Consideration of the fact that we have both an Executive and Legislative Branch would provide a welcome change from the attitude of both the Clinton administration on health care and the Bush administration on virtually everything. This addresses some of the problems of the Clinton approach but not all. HillaryCare died not simply because of Harry and Louise ads from the insurance industry but because a majority of Americans felt it was a bad plan being imposed upon them from above. This meant not only that it was a plan developed in secret by the Clinton White House, but was also was a reaction to the type of plan developed. The plan was overly complex and overly regimented. Many Americans are uninsured or under-insured and desire assistance in obtaining affordable health care. Many others are perfectly happy as they are and do not want the government to be any more involved in their lives. A successful plan must consider both views–as Obama often has when discussing his plans for change. A health care plan must be kept as simple as possible (considering the complexity of health care). This means simple for the individual–not the government. In many ways it would be simpler for the government for a plan to have mandates, avoiding all the problems of individuals who choose to postpone purchasing health care. This complicates things for writers of a health care plan but is not an insolvable problem. The otherwise faulty Medicare D Plan has managed to overcome this problem by having the rates adjusted based upon when someone joins the plan. Even the Medicare B plan is voluntary. Besides, mandates make it far too easy for politicians to claim to have provided health care for all even if it means requiring everyone to participate in a bad plan. Freedom of choice provides a necessary safety valve to ensure that the plans are truly beneficial. The question of mandates arose during the 2008 nomination battle between Obama and Clinton. Mandates, along with the manner in which the plan was developed, were only a portion of the problems with Hillary Clinton’s approach to health care. The plan was overly complex, such as in its demands for creations of regional alliances of health care providers with vast government regulation. The reaction against such an unnecessary over-expansion of government led to Republican dominance of government for years afterwards. Subsequently we have seen more modest attempts at government involvement to expand access to health care, such as in the plans promoted by John Kerry in 2004 and Barack Obama in 2008. Hopefully Congress, along with the Obama administration, remember all the lessons of the failure of HillaryCare in working on health care legislation.